Hardcover, 9.5 x 12 in. / 264 pgs / illustrated throughout. Edited by Juliet Kinchin. Text by Tanya Harrod, Medea Hoch, Juliet Kinchin, Francis Luca, Maria Paola Maino, Amy Ogata, Aidan O'Connor, David Senior, Sarah Suzuki. MoMA's illustrated history of design for children - 100 years of toys, clothing, playgrounds, schools, furniture, posters, animation and books. In 1900, Swedish design reformer and social theorist Ellen Key published The Century of the Child, presaging the coming century as a period of intensified focus and progressive thinking around the rights, development and well-being of children. 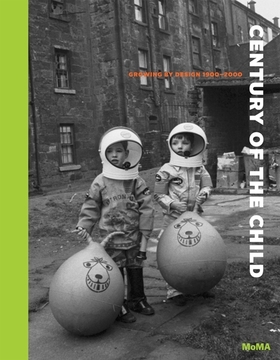 Taking inspiration from Key-and looking back through the twentieth century-this volume, published to accompany an exhibition at The Museum of Modern Art, examines individual and collective visions for the material world of children, from utopian dreams for the "citizens of the future" to the dark realities of political conflict and exploitation. Surveying more than 100 years of toys, clothing, playgrounds, schools, children's hospitals, nurseries, furniture, posters, animation and books, this richly illustrated catalogue illuminates how progressive design has enhanced the physical, intellectual, and emotional development of children and, conversely, how models of children's play have informed experimental aesthetics and imaginative design thinking-engendering, in the process, reappraisals of some of the iconic names in twentieth-century design and enriching the unfolding narrative of modern design with other, less familiar figures. Divided into seven sections-"New Century, New Child, New Art"; "Avant-Garde Playtime"; "Light, Air, Health"; "Children and the Body Politic"; "Regeneration"; "Power Play"; and "Designing Better Worlds"-The Century of the Child focuses on individuals and projects that represent innovative and comprehensive contributions to design for children. Featured image, a 1946 enameled steel and oak school desk by Jean Prouvé, is reproduced from Century of the Child. "It is something of a cliché to state that children are the future, but for modernist designers with a clear vision of the society and values they wanted to shape, children have been an obvious starting point," says [MoMA's "Century of the Child"] curator Juliet Kinchin…Over the last 100 years or so, the idea of the "modern child" was shaped by the same forces that shaped the rest of society: industrialization, urbanization, and consumerism...This may be the single most important, overriding dynamic regarding design for children from the early 20th century to today: Adults create new products for kids and kids, in turn, create new worlds. Kids had it good in the 20th century. Designers gave them revolutionary playthings like Lego and Tinkertoys and the Rubik's Cube, made to be both fun and good for them. Geniuses like Frank Lloyd Wright gave them deluxe schools…"We're looking at principles and issues that take us to the core of thinking about creativity in every aspect of our culture," says Juliet Kinchin…MoMA's curator of modern design. "You really see how fundamental design and children are to the modern world." In the tumult of the last century, governments left and right, democratic and tyrannical, invested lavishly in children and their spaces, as a way to seize the future and plant the national flag there…[Kinchin's] exhibition lays out how the children's "colonies" of fascist Italy and the kindergartens of the Soviet Union each housed their charges in shiny modern structures, away from the old-fashioned views and tastes of their parents. 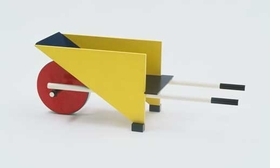 Schoolkids, both receptive and captive, were the ideal audiences for radical modern ideas and objects…Kinchin's show puts the Sputnik playgrounds of Czechoslovakia beside Barbie's Dream House and the wooden toys of Creative Playthings to give a picture of a culture where children were separate, but better. 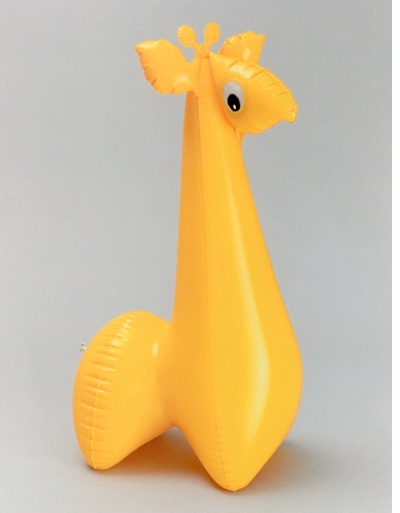 This is the first published survey of the 20th-century design for children. And what an amazing publication! Taking inspiration from Ellen Key's Century of the Child (1900), this book bridges the gap between childhood and progressive design by examining individual and collective works from the world of children. Kinchin and O'Connor (both, MOMA) cover toys, books, games, and playgrounds, but also furniture, safety equiptment, and architecture, providing an exceptional overview of the history of design for the past 100 years. The book illustrates how designing for children stimulated creative freedom and encouraged experimental aesthetics... Beautiful illustrations accompany every section. An easy-to-use index and an extensive list of references are included. Given its multidiscliplinary content, this volume is a must for any collection. Art students will love it, and students involved with history, politics, health, child studies, and communication-- just to mention a few other discliplines-- will discover unique information about the world of children. "Play is the highest stage of the child's development… the purest, the most spiritual product of man at this stage, and it is at once the prefiguration and imitation of the total hman life—of the inner, secret, natural life in man and in all things. It produces, therefore, joy, freedom, satisfaction, repose within and without, peace within the world." - Friedrich Froebel, 1826, quoted in Juliet Kinchin's chapter, "The Kindergarten Movement: Building Blocks of Modern Design." FORMAT: Hbk, 9.5 x 12 in. / 264 pgs / illustrated throughout.